It has officially arrived! 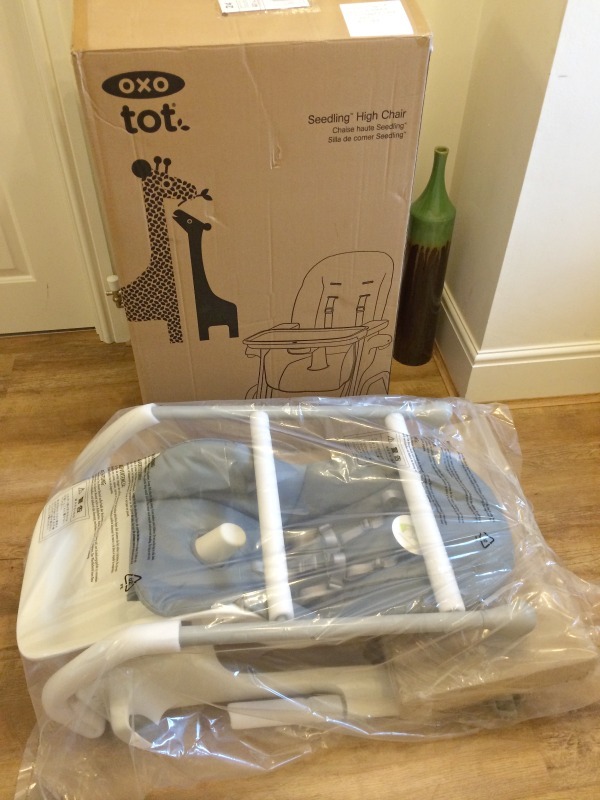 Our Oxo Tot Seedling Highchair and I can’t tell you how excited I am for it. If you haven’t noticed we are huge, huge Oxo Tot fans. Our old other brand highchair from when Buba was little wasn’t doing us any favours so I am so ecstatic to replace it with this one. I was happy to see when I opened it, it was nicely packaged in three pieces making assembly fast and easy. It only took me two seconds to unfold the seat, connect the back legs and it was ready to go. Right away I was impressed with the design, the modern look and feel to it. I choose the Graphite colour which I think matches our dining room perfectly but it was a hard decision between the other two beautiful colours; green and mocha. The legs are great on our hardwood floors too. The back are rubber to keep from sliding all over and scratching up our floors. 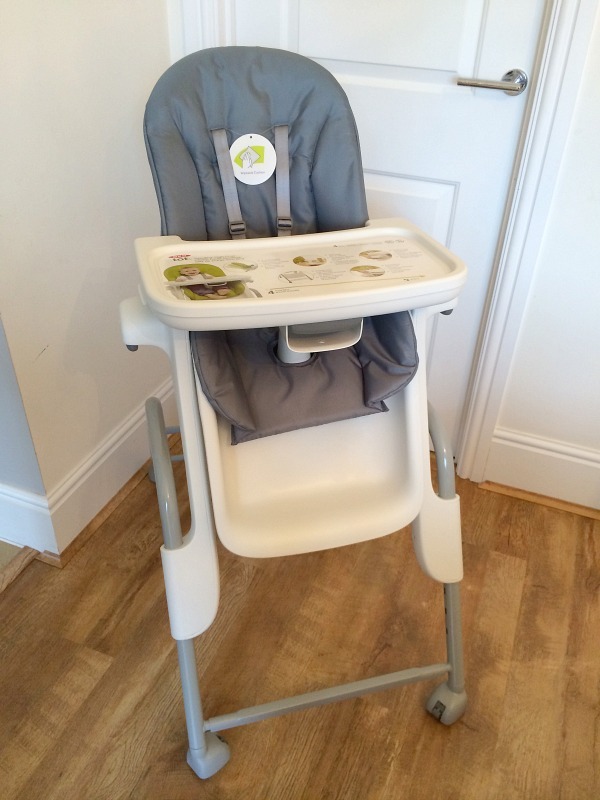 The front legs are wheels to roll wherever you want the highchair to be and then lock in place for safety. One of the many safety features I love about this highchair. Another great safety feature is the five point safety harness to secure your little one in his/her seat for a safe mealtime. 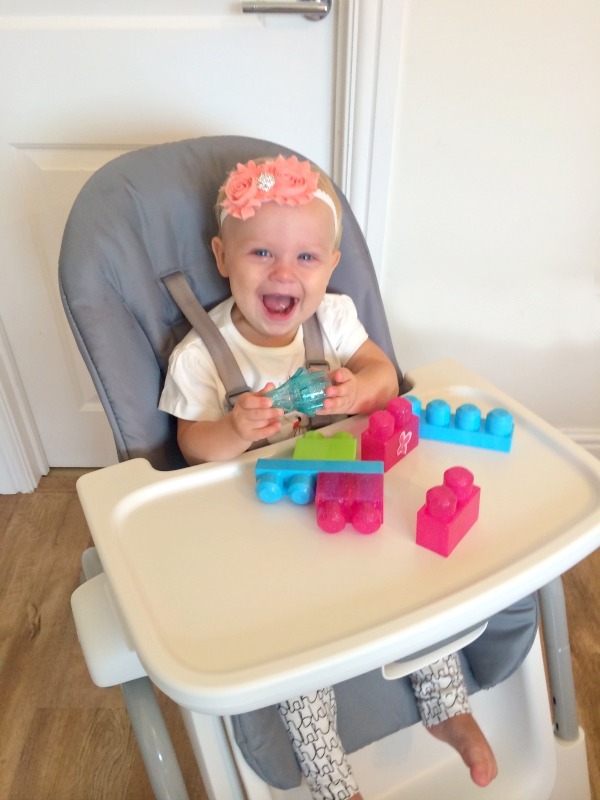 I really liked this feature because I like our highchair right up to our table or even the kitchen bar without the double tray on and knowing Missy Moo is safely secure in her five point harness is a great relief. I don’t have to worry about her falling out of it or getting out of the straps like she has done on other highchairs. 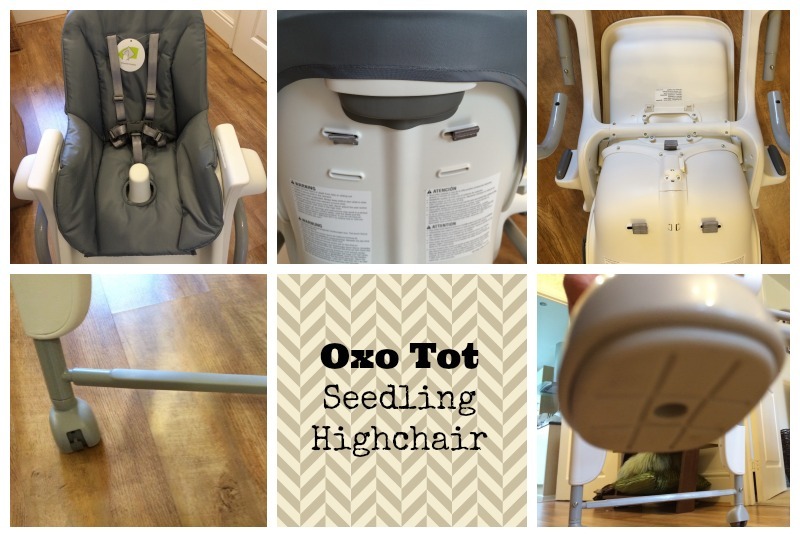 There are so many great features to Oxo Tot seedling highchair including an adjustable seat from upright to reclined in three positions and adjustable seat height from high, medium or low to accommodate any table height or for play time. We already love to have our afternoon snack with Missy Moo in it and lower it so Buba and I can sit next to her on the floor for playtime and we can all be together at the same height. It also is a perfect height for when she gets older and can climb in herself. Our dining room table is very high compared to most highchairs so I was so excited when this one went high enough to all be at eye level together during family dinners and even high enough to use at our kitchen bar. The double tray provided is the best bit. The top cover is dishwasher safe that is removable with one hand. 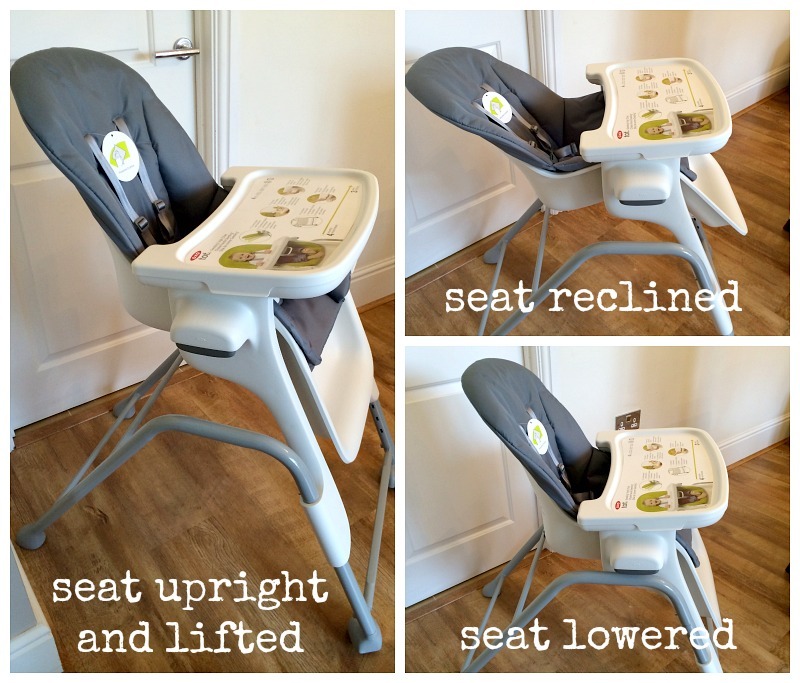 The whole tray can easily be stored on the back of the highchair too if you prefer to have the highchair pushed right up to your table. It lays flat on the table for easy clean up! I love the soft feel to the tray and it seems to make it harder for food or plates to slide around as easily as they do on other brand highchairs. I will say that I think the double tray is a little on the heavy side but nothing to condemn this highchair. 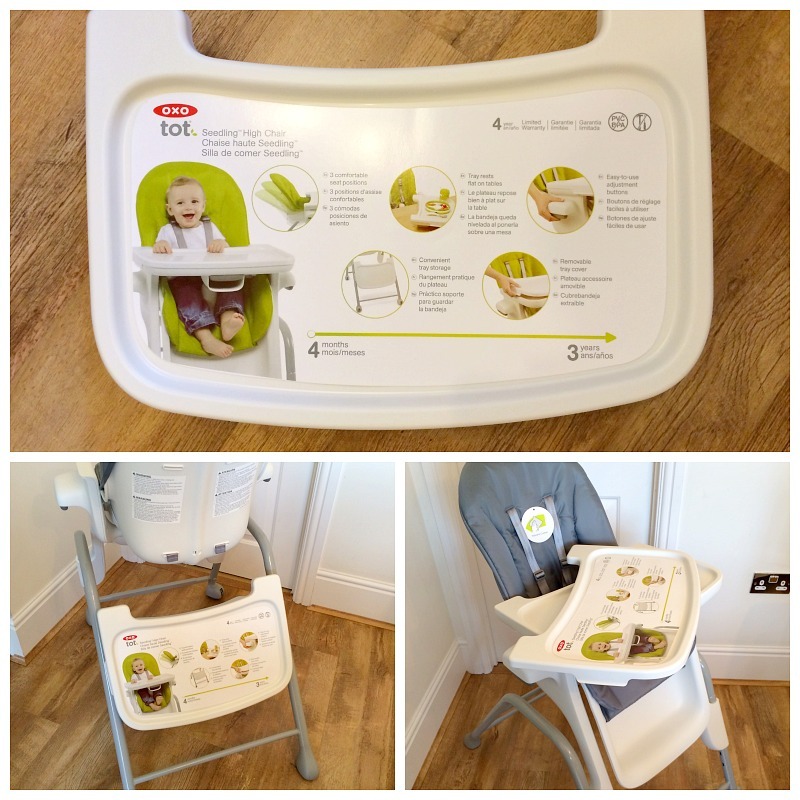 The Oxo Tot seedling highchair is perfect from 4 months to 3 years of age to provide a safe and comfy place that will grow with your child. At £159 price tag it really is worth the investment for the length that you will be using it! It is available at John Lewis. I think it’s safe to say that Missy Moo thinks the Oxo Tot seedling highchair is brilliant too. Just look at that smile, that says comfy and happy to me! I wouldn’t mind a seat this cozy for me to sit in at mealtime although that might be a little dangerous for this tired momma of two, I might fall asleep. I guess I would need the seedling highchair‘s reclining abilities too then we would all be eating and resting in style! *I was sent this product for the purpose of this review but all photos and opinions are my own. Thanks Hun. 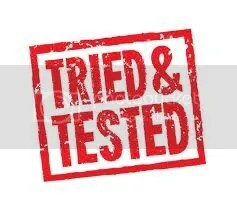 It truly is a great highchair. I am excited to share our playtimes and meals ahead with everyone soon. Was really impressed with the quality and color too!